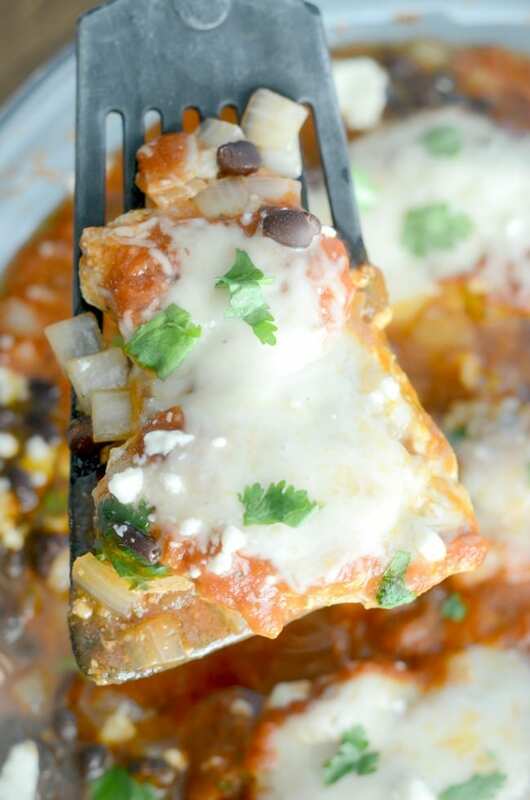 I pinky swear that you and your family will love this chicken enchilada skillet! It’s made in one pan, is full of flavor and ready in under 30 minutes. Seriously. Oh friends. I am SO BEYOND EXCITED to share today’s recipe with y’all. There are so many reasons why but the top three are – it’s made all in one pan, it’s done in under 30 minutes and it’s full of flavor. 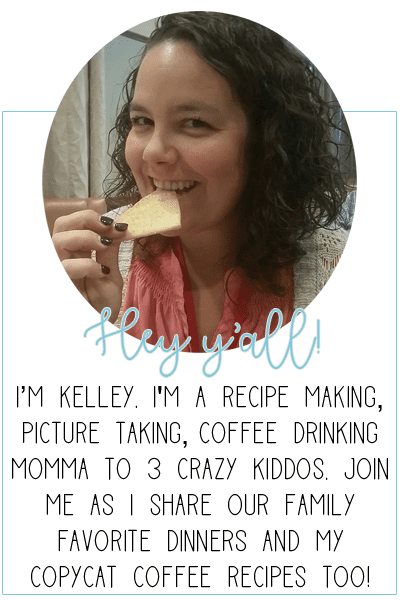 Those are literally my three favorite things when it comes to quick and easy dinner recipes. It’s also gluten free and low carb (minus the rice). It’s seriously the best y’all! 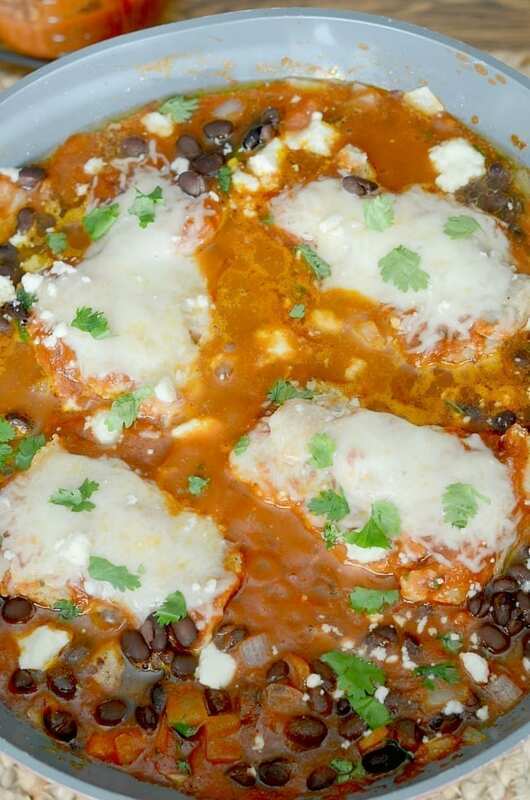 I feel like talking about this chicken enchilada skillet like it’s a person is kind of weird, but also kind of not. It deserves to be talked about with all the heart eyes and kissy face emojis. One of the best things about this quick and easy dinner recipe is that it is made all in one pan. (!!) That means less dishes when it’s done. (!!) If this recipe didn’t have so much flavor, I would say that only having one dish to clean is the best thing about it. Oh and it all comes together in under 30 minutes. I know a lot of recipes claim they are quick and easy, but I timed this one. Totally came in under 30 minutes! It’s an easy (and delicious) way to have all the Mexican flavor without all the work that some dinner recipes require. To recap – this chicken skillet dinner is a one pan dinner recipe that is full of flavor and ready in under 30 minutes. It’s seriously the best! For the chicken you can use either breasts or thighs for this recipe. We like to use thighs but chicken breasts would work great as well. 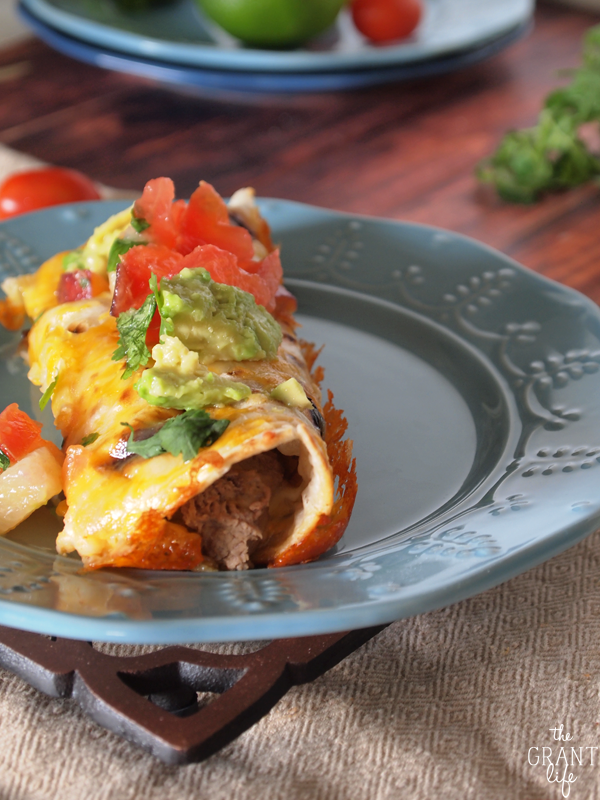 I love using a batch of my homemade enchilada sauce for this recipe but store bought works too. 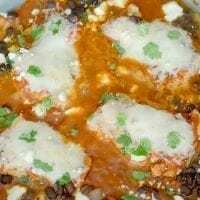 My favorite part of using homemade enchilada sauce is that I know exactly what the ingredients are and I can adjust it to my level of spiciness. Also, I kept my spices on this recipe fairly basic and mild because the enchilada sauce has so much flavor. Feel free to add additional spices to your chicken. 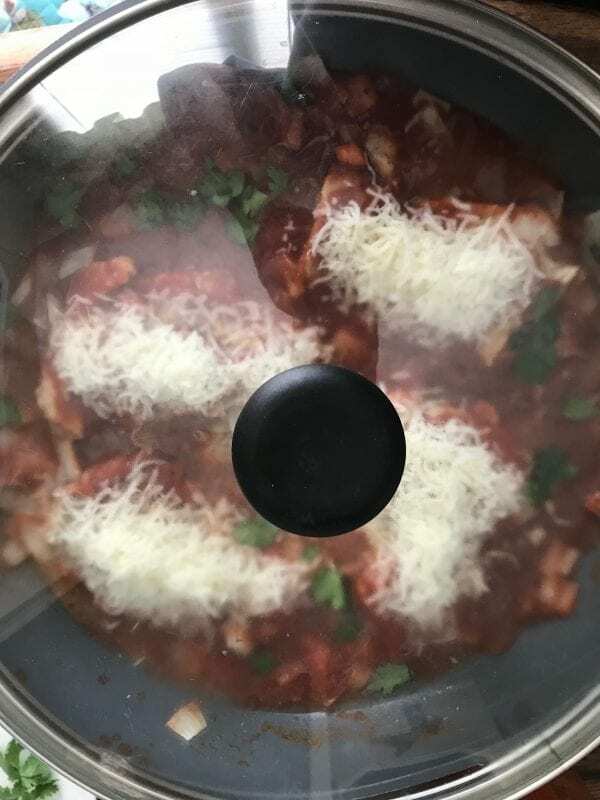 I top the chicken with mozzarella cheese and then sprinkle queso fresco on at the end. 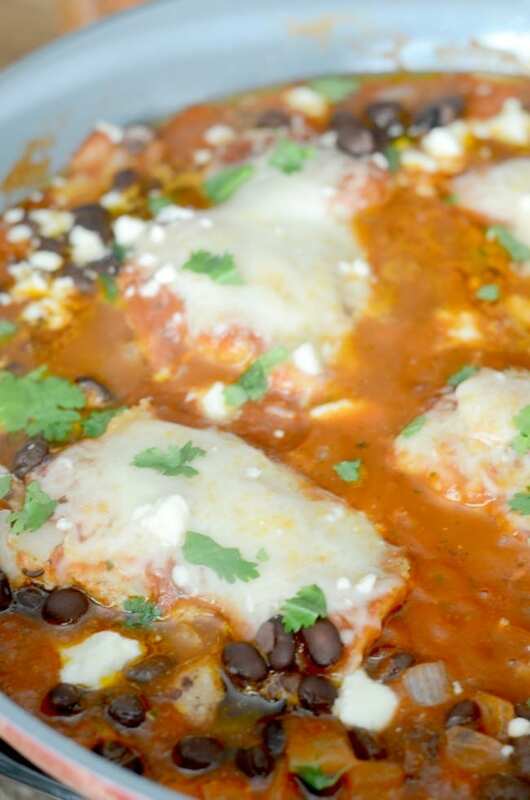 Mozzarella is a great mild cheese that goes great with the enchilada sauce. It also gets super melty and delicious. 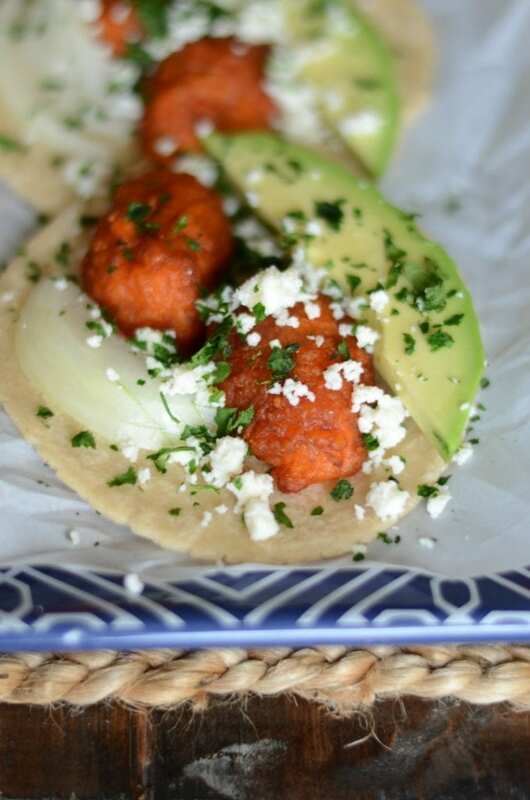 Queso fresco is a crumbly cheese that is common in Mexican dishes. It’s a great addition to this dish because it tones down the spice from the enchilada sauce and cilantro. To make this dish you need to start with a hot skillet. You can use cast iron or non-stick, both work great. 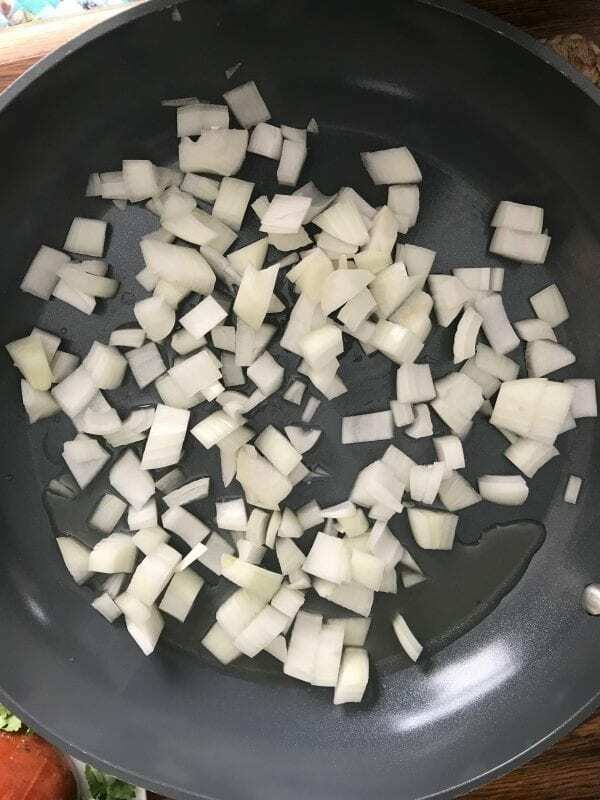 Take your chopped onion and a little bit of butter and add it to the skillet. Allow it to cook for a few minutes and then add in your chicken. You don’t need to fully cook the onion before adding the chicken because it stays in the skillet the whole time. Just scoot it to the sides when you add the chicken. Cook the chicken for about 5 minutes on each side. You want to make sure you get a good sear on the chicken and that it is almost cooked through. It will simmer in the enchilada sauce so it doesn’t need to be totally cooked before you add it. Toss in the enchilada sauce and allow to simmer for a few more minutes. Add the mozzarella cheese on top and cover so that it melts. You want to get a good gooey, melty top to your chicken. At this point you can add in your black beans as well. Once the mozzarella melts, remove from heat and sprinkle on the cilantro and queso fresco. Add the chicken and push the onions to the side. 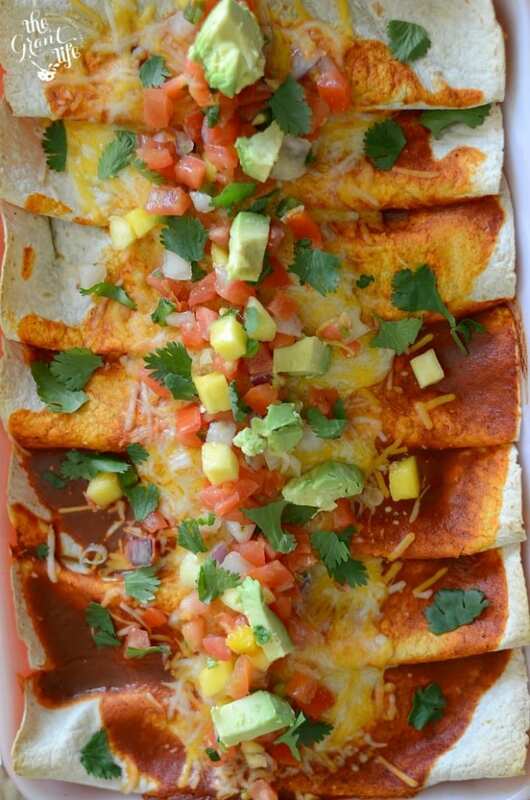 Cover the chicken in enchilada sauce. Add the mozzarella cheese and cover. 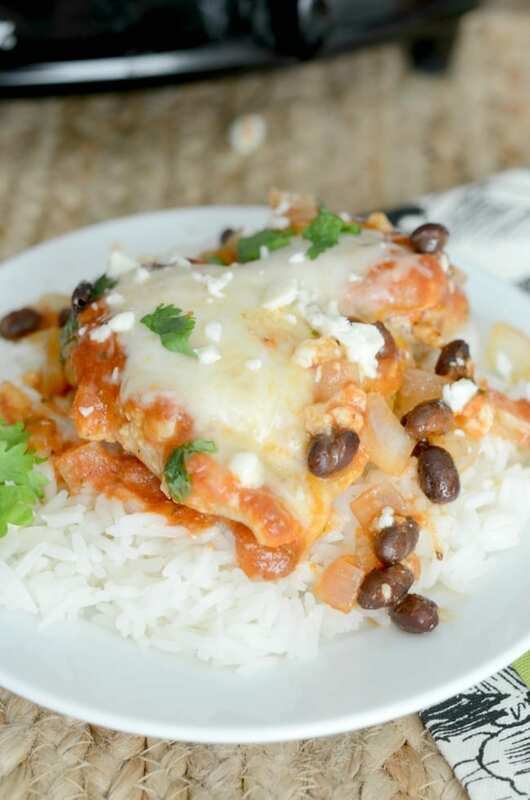 You are going to want to make this enchilada chicken skillet again and again and again. It’s on permanent rotation in our menu plan at our house; and I’m totally fine with that. One pan, 30 minutes and full of flavor! In a hot skillet, add the butter and onion. Cook for 5 minutes. Push the onion to the side of the skillet. Add in the chicken. 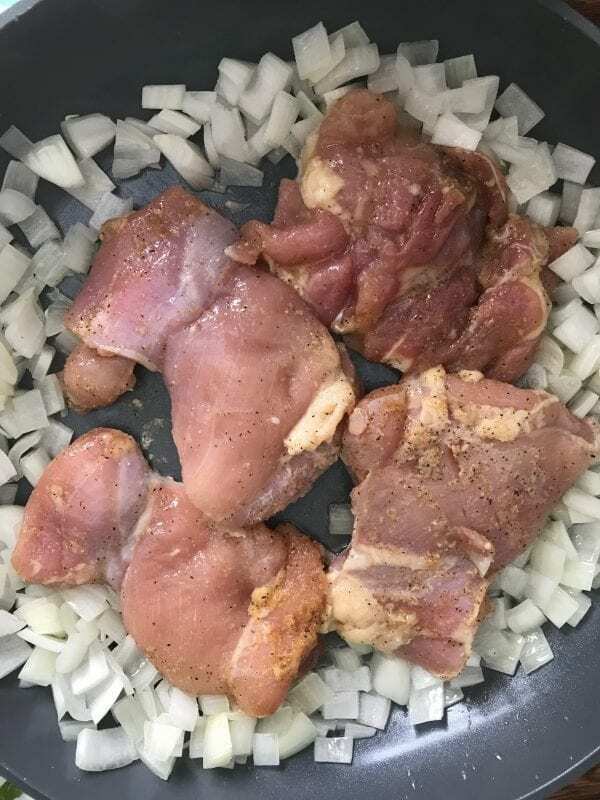 Sprinkle the garlic and onion powder plus the nature's seasoning over the chicken. Cook 5 minutes each side. 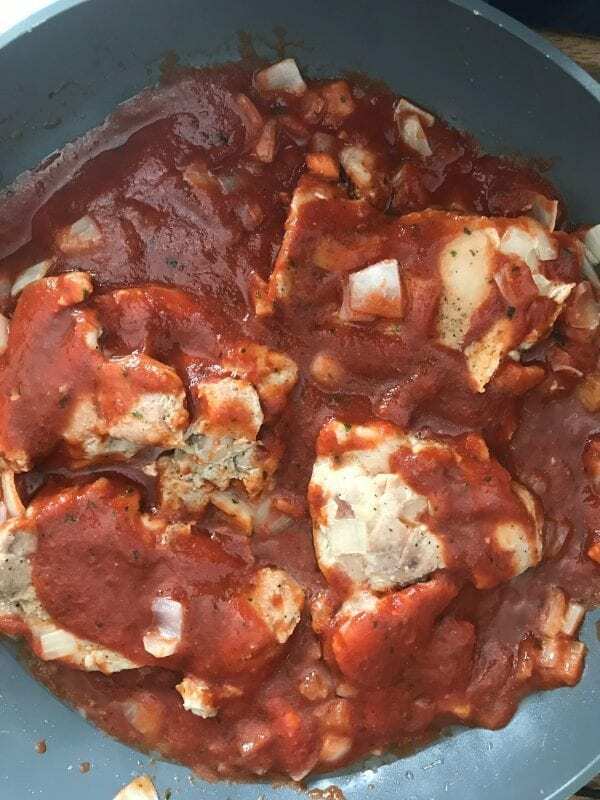 Pour in the enchilada sauce and spoon over the chicken. Push the onions back around and add the black beans in as well. Allow to simmer for 10 minutes. Sprinkle the mozzarella cheese over each piece of chicken, reduce heat, and cover. Allow the cheese to melt and then remove from heat. Sprinkle the queso fresco and cilantro over the entire dish. Allow to cool slightly, serve over rice and enjoy!